Customers often ask me whether or not vines should be removed from their trees. Before that question can be answered, first of all we have to identify the vines on the tree. Certain vines are much more aggressive than others. Some vines do not climb all the way to the top of the tree. Some only go up 10- 15 feet, some go up a little higher, and some go all the way up to the top of the tree. Some vines are deciduous, giving the evergreen trees such as cedars, pines and live oaks some reprieve in the winter months. The most destructive vine to trees in this area is the English ivy vine, which I have seen grow to the top of trees and envelope the canopy. Once this happens, the vine leaves cover up the leaves of the tree, and the tree actually slowly starves, eventually dying. Since English ivy is both invasive, fast growing, hard to contain and evergreen, this poses a serious problem for infested trees. In fact, due to its invasive and destructive nature to native plants, many nurseries have stopped selling it completely. Extreme English ivy infestations can be costly and time consuming to remove from large trees. 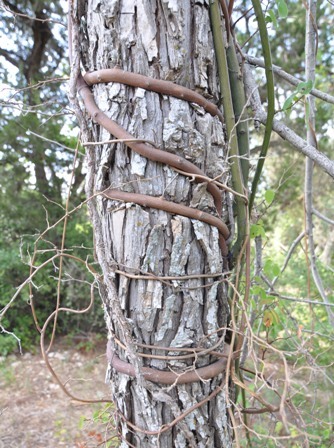 Vines have to be unraveled or pulled and cut off the bark with a pruning saw. If the vines are dead in the tree, they take even loner to remove because the break off in little pieces instead of larger sections. In the Austin area the second most destructive vine to trees would have to be the mustang grape vine. Although this vine is native and deciduous, it is quite destructive and fast growing during the long growing season we have here. It can reach great heights in the tree canopy, enveloping in some cases entire trees or even groups of trees. Additionally, it gets much worse when water is continually available such as by lakes, rivers, intermittent streams and shady areas with high water tables. Many people also propagate these vines or the grapes they produce, which can be used for wines and preserves. The stems of this vine can get extremely large, up to 12 inches in diameter or larger close to the ground in extreme cases. Another fast-growing and sometimes problematic vine is the wisteria vine. When kept to trellises and pruned repeatedly to keep it at bay, this vine can be a beautiful addition to a landscape. However, when neglected or allowed to grow up into trees or stands of trees, this vine can prove to be quite destructive. Due to its high rate of growth, it can spread through trees very rapidly, enveloping them. Lastly, vines such as Virginia creeper and poison ivy can also get high into a tree’s canopy. These two vines are often confused with each other. Virginia creeper has 5 leaves and poison ivy has only three. Both are typically less problematic than the others listed above, but Virginia creeper also can envelope entire limbs in extreme cases and may need to be prune out of certain trees. A little information about poison ivy is important at this point, as it can be a serious pest in the urban landscape. Poison ivy is often problematic not only due to the fact that it infests your trees, but mainly due to the sap. The plant (leaves AND stems) contains a poison (toxicodendrol) with reacts with a persons skin and causes severe rashes (rhus dermatitis) that are extremely itchy, red, raised and blistered, and may persist for, in some cases, many weeks. If swallowed or if chipped and inhaled, it can have very serious consequences. Some people are hypersensitive to it, others are immune to it. Most people (more than half of the population) get at least some reaction when expose to it, and severity of the reaction depends on amount and duration of the exposure. We recommend learning how to identify it properly and staying away from it. If poison ivy is in your back yard or in your tree, we recommend removing it right away. Wear rubber gloves and keep out of contact with surfaces that are contaminated. Keep in mind that the sap of the vines/stems can be more concentrated than the leaves! Make sure that clothes that are in contact with the vine are washed right away and separately. It is important to note, that if left in the yard, pets will eventually rub up against the leaves of the poison ivy, and then transfer the sap to their owners. If left in the trees, the vine continues to climb up into the canopy, making tree maintenance near impossible. It has to be removed from trees prior to pruning, to allow access to the tree. Lastly, there are other landscape vines that can climb into trees in this area, but they are generally not problematic. Jasmine vines (star or Asian varieties) are generally not a problem because they do not climb very far up the trunks. They can be easily maintained at 6-8 feet up the tree. I have rarely seen trumpet vines or other ornamental vines that are really all that invasive either. Keep in mind that if you do have a serious vine infestation in your trees, but do not have the budget to have the vines removed by a tree service, you can always cut them at the base. When cut at the base, the vines die in the tree, and no longer grow and continue to compete with the tree. Although often aesthetically displeasing, as the vines wither and dry up in the tree, it is better than losing a tree to a choking vine. Often in these cases, budget dictates and sometimes the trees are in a heavily wooded riparian or greenbelt area, and completely removing vines is not a priority but tree survivability is. Trees and construction What is mistletoe and should I be concerned if I have it in my trees?